The Prince Charlie Jacket and Vest are ideal for formal occasions such as a wedding. 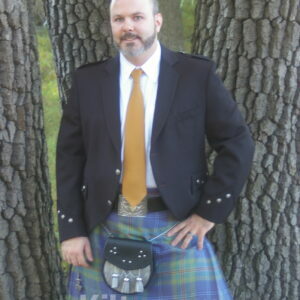 The kilt jackets & vests are made in Scotland using our finest 15 oz Wool Barathea. The Prince Charlie Jacket is the traditional style of kilt jacket, so if you are looking for an authentic look, this is the jacket for you. We keep a wide range of sizes in stock, but some of the less common jackets may need to be custom made, which may take up to 8 weeks (usually 3 or 4 weeks). 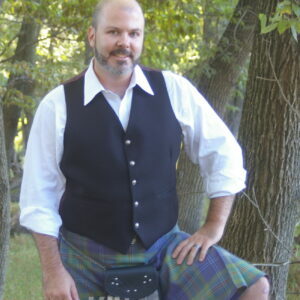 If your order is urgent, please contact us before ordering to double check that your kilt jacket is in stock. Note – Because our Prince Charlie Jacket and Prince Charlie Kilt Vests are made in Scotland, they are made to UK sizes. For US customers, please order one size bigger. For example, if you are normally a US size 44 Regular, then make sure you order a 46 Regular. Similarly, if you are a US 40 Long, order the next size up (42 Long). If you have any questions, please just let us know! 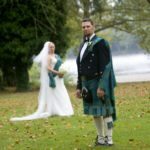 Please ensure you consult our kilt jacket measuring guide prior to ordering.